Kiss Plans on Second Term! His name may not be a household word despite what he does for work, but the rookie mayor of the largest city in Vermont told “Inside Track” this week he likes his job so much, you can put him down as a candidate for reelection in March 2009! Bob Kiss, 60, was a Progressive Party state representative from Burlington’s Old North End when he won the vacant three-year term following Progressive Mayor Peter Clavelle in March 2006. The former social worker is a tall, quiet, unassuming guy who surprised a few people when he decisively won the Queen City’s first instant-run-off mayoral race. Under the new election rules, a candidate needed to break the 50-percent threshold to claim victory. As for Bob Kiss, the Quiet Man was top dog with 39 percent of the votes as voters’ first choice. Democratic State Sen. Hinda Miller, who had a well-funded campaign with well-known supporters, was second with 31 percent. And Republican Kevin Curley, a former city councilor, finished third with 26 percent. Then the brand new instant run-off system kicked in under the guidance of Director of Elections Jo LaMarche. She and her crew quickly totaled the second-choice votes and announced the Quiet Man had won a decisive victory over Hinda, the not-so-quiet Democrat. Kiss beat Miller 4761-3986. Monday afternoon, yours truly dropped by for a chat. Progressive forerunners in the mayor’s office, Kiss is very conscious of the bottom line. Asked to name his proudest achievement to date, Mayor Kiss answered, “Putting two budgets together that met the city’s needs with very little acrimony.” Kiss said his mission “to pay attention to the financial details of running a city while paying attention to social-justice needs” is what it’s all about. Asked if he could do one thing as mayor for the City of Burlington, Kiss surprised us with his answer. “I would end the war in Iraq,” he said. “Because by 2017 we will have spent $2 trillion on it,” he lamented. There used to be funds for Urban Development Action Grants and Community Development Block Grants. Now those taxpayer dollars fuel the endless Bush-Cheney war. As for his own political future, Kiss made it clear to “Inside Track” he will be running for reelection in 2009. “Quite a few things,” he explained, “just can’t be resolved within three years.” It takes longer. He mentioned two things: constructing the Champlain Parkway to get truck traffic off Pine Street, and outdoor lighting. “Sky glow,” he told us, has become an issue for him. As for political ambitions beyond mayor, Kiss said that, unlike his progressive predecessors in the corner office — Bernie Sanders and Peter Clavelle — he has no ambition for statewide office. He’s perfectly content where he is. But he would like to see fellow Progressive Anthony Pollina step up and take on incumbent Republican Gov. Jim Douglas in ’08. Can Gov. Douglas be beat? “Jim has been at this for a lifetime,” replied da Mayor. “He’s very good person-to-person. He’s at all the events and has had the opportunity to build a team that delivers at the state government level. But I really do think that there’s a different vision that could be even more successful,” said Kiss. Moving On — As 2007 wraps up, the Kiss administration is losing two veteran top department heads. Community and Economic Development Director Michael Monte is moving on after a very long run with the Sanderista/Progressive political regime, which moved into city hall in the early 1980s and revitalized a crumbing old town that had seen better days. Yours truly can still picture Ol’ Mike among the handful of Sanders supporters in the city clerk’s office on that March Election Night in 1981. The night the miracle happened. Michael started Monday as the chief operating officer at the Champlain Housing Trust. Monte, incidentally, had publicly endorsed Democrat Hinda Miller in the 2006 mayoral race, yet Bob the Prog kept him on as CEDO boss. Another longtime Burlington regular departing is Police Chief Tom Tremblay. Tommy Terrific first put on the Burlington blues way back in 1983 — around the time Monte signed on. He worked his way up through the ranks from beat cop to detective to administrator. Now Republican Gov. Jim Douglas has tapped Tommy Terrific to replace Commissioner of Public Safety Kerry Sleeper. That’s right, our Republican Guv is snatching up the top cop in the People’s Republic of Burlington and making him his top cop. Was Bob the Prog surprised GOP Jim picked Tremblay to be Vermont’s next top law-enforcement official? He’s got that right, too. Kiss said he will be putting out an employment ad and hopes to fill the spot by February. Early buzz reflects the hope that a selection will be made from within the current BPD ranks. Kiss makes the call, with city-council approval. House Secrets? — Yours truly takes one weekend off, and what does the distinguished Republican caucus of the Vermont House do? They hold their pre-session caucus in secret, barring attendance by members of the Fourth Estate. And it looks like the only reporter they had to lock out was a distinguished old-timer of the Vermont airwaves: Andy Potter from WGOP, er, sorry, WCAX-TV. A week earlier, House Democrats held their pre-session caucus with the doors open. What the hell is this tiny minority worried about? That somebody will actually press them to come up with an idea on their own? Or that someone will be there to witness their complete inability to do so? In the Trenches — That how Sen. Patrick J. Leahy sounded Tuesday during a break in the negotiations on Capitol Hill. The Vermonter had spent all morning in “line-by-line” negotiations on the Foreign Intelligence Security Act (FISA). 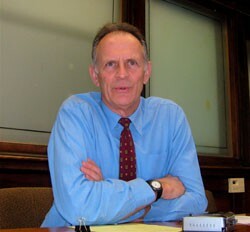 The former Chittenden County State’s Attorney, like most Americans, has a problem with the warrantless wiretapping the Bush administration has made legal in recent years under the guise of fighting terrorism. This shredding of the Constitution comes from the same team that lied to the American people about the late Saddam Hussein’s WMDs, his threat to our nation and much, much more. Yet, despite those lies, the Bush White House rules on. Why? As long as the GOP holds tight and prevents the Democrats and GOP defectors from getting the 60 votes required to halt debate, the Senate stalemates will continue. If you feel depressed, you are not alone. But let’s not forget the Vietnam War of the 1960s and ’70s, the senator reminded us, a war likewise based on lies and propaganda. Reefer Madness — Gov. Jim Douglas threw some more hot coals on his “Reefer Madness” fire Monday, going on Ch. 3 News to continue his attacks on Windsor County State’s Attorney Robert Sand. Douglas had, with great fanfare, ordered all first-time marijuana cases in Windsor County to be sent henceforth to the Vermont Attorney General for prosecution. That’s because Prosecutor Sand had decided on court diversion for a 61-year-old first-time offender, a lawyer who was growing her own grass. Sand has previously called for the state to reexamine its drug laws. He’s raised the question of whether our resources could be better spent policing and prosecuting crimes that inflict serious harm to our citizens, such as drunk driving and burglary. Of course, Sand the Prosecutor never said he would have a one-size-fits-all policy, but Gov. Douglas was not going to let that get in his way. Our governor appears to have realized overnight that his recent “Reefer Madness” outburst simply wasn’t flying. There is, after all, an election next November. Whew! Surely the attorney general’s office has better things to do, eh?